Sundara Silk Lace in Amazon Gold. 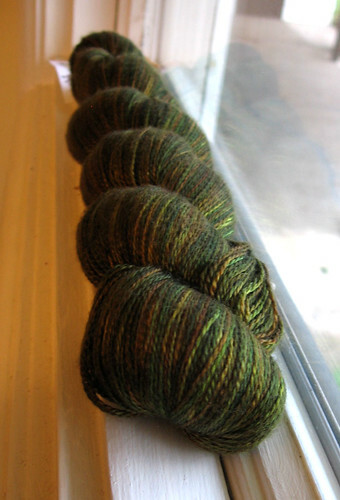 My lone skein of lace weight yarn. I do not like knitting with lace weight, but this skein is so incredibly beautiful that I’ll make an exception for it. I’m not sure what it’s going to become yet, but I’ve got a couple ideas. Reminds me of August woods with the dark greens yet some browns like dry grasses. Beautiful yarn! Absolutely gorgeous color, I’m green with envy (but not that lovely shade of greens). I’ve had great luck using Sundara silk lace held double strand – the drape is amazing, and the colors blend beautifully. Ditto on feelings about knitting with laceweight. I can totally see this yarn as a shawl, very pretty.